Disclaimer: I was provided with products to test and review with my honest and open opinions. My views are my own and your views may differ. I was not otherwise compensated for this blog post. Thank you! Mom's Gone Bronson is not responsible for prize fulfilment. Who doesn't want games this Christmas!? The more the merrier, and here are some favorites, even with a twist! 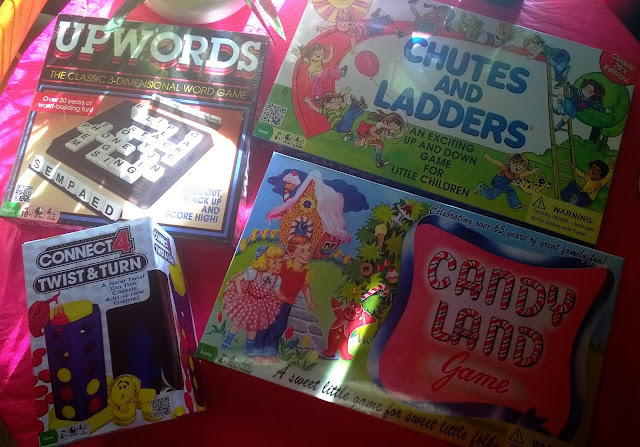 Check out Candy Land, Chutes and Ladders, Upwords and Connect 4: Twist & Turn! Upwards is the game of words that builds up and out and over and makes spelling fun! You have to stay on your toes to out-match your opponents and this is a game the whole family can really get into and play! Candy Land is the game that has, for years, given so much fun to so many families and keeps on giving, today! Even if you have younger players then this is a game that they can get into and play along with - my 4 year old especially loves it and is always happy to play! Chutes and Ladders is a timeless game where you go around the board and up ladders or down chutes all depending on where the game takes you and you want to hope to find yourself at the end before other players! A quick and fun game for everyone, and a great starter game for the little ones! Connect 4 Twist & Turn is a great spin (no pun intended) on the original Connect 4 game, but instead of just popping in pieces and making up a line, you can twist and turn the game around to make up your connections and win the game! These and MANY more games are available at Winning Moves Games and you can ALSO enter to WIN the 4 games via the giveaway, below! Please follow Mom's Gone Bronson's Holiday Gift Guide via social media #mgbhgg, thank you!